President Trump is reportedly planning to oust Secretary of State Rex Tillerson, with CIA Director Mike Pompeo potentially replacing him. The will come in the next several weeks, The New York Times reported, citing senior administration officials. Still, The Times added that it is not clear whether Trump has approved the plan, which was devised by chief of staff John Kelly. Some administration officials had in the past suggested Tillerson could be replaced by U.S. ambassador to the U.N. Nikki Haley, but Pompeo has become the favorite to take the role due to his rapport with Trump, the Times reports. The Associated Press also reported that the Pompeo swap is under consideration. Under the plan, Sen. Tom Cotton (R-Ark.) would replace Pompeo as CIA chief once Pompeo moved to the State Department. Cotton is expected to take the CIA job if offered, according to the Times. A spokeswoman for Cotton said his focus is on serving Arkansas in the Senate. Tensions between Trump and Tillerson have been brewing for months. Earlier this year, Tillerson denied an NBC News report that top Trump administration officials, including Vice President Pence, had urged him not to step down from the State Department. “The vice president has never had to persuade me to remain as secretary of State because I have never considered leaving,” Tillerson said. Trump and Tillerson have also clashed over other issues. “Save your energy Rex, we’ll do what has to be done!” Trump tweeted at the time. 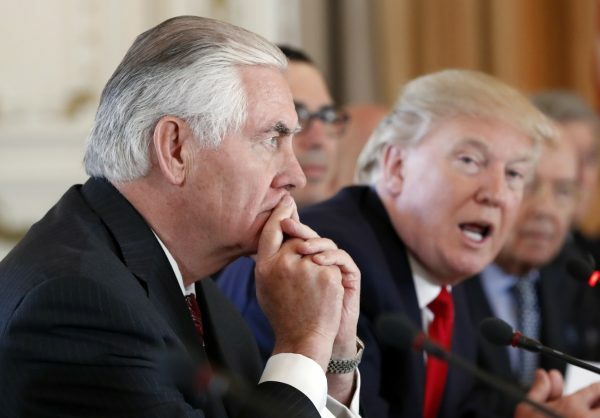 Tillerson reportedly wanted to remain in his position until the end of the year “to retain whatever dignity he could,” according to The Times. 2,000 plus likes for a tweet that is factually and categorically wrong. access both to the American political class and media. Israel has been uniquely successful at imposing its will over Congress and the White House, as the U.S.